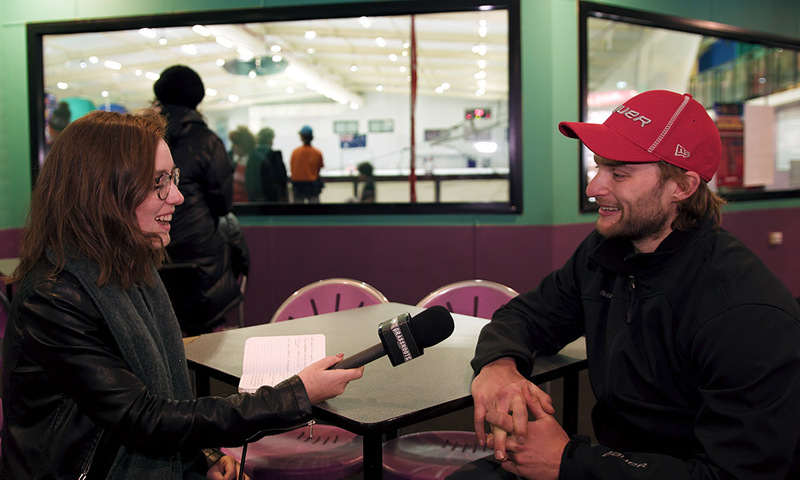 Grassroots Sports caught up with Australian NHL prospect Nathan Walker at the ECSL All Stars game in August. Journalist Alyssa Longmuir spoke to Walker about being home for the AHL off-season, signing a fresh contract the Washington Capitals and his real shot at playing in the NHL this season. If you did not know who Nathan Walker is you’d be forgiven for not recognising Australia’s brightest ice hockey star on the street. Even at the rink attending an event he is the special guest to he manages to remain unassuming. At 5’9”, his playoff ‘flow’ still intact, a Bauer cap firmly attached to him at all times, you would be excused for thinking the 24-year-old was one of the East Coast Super League All Stars and not the first Australian on the cusp of making the world’s best professional league – the NHL. Walker was back in Australia for the AHL off-season, fresh off signing a shiny new two-year contract with the Washington Capitals. “It’s huge for them to be invested in me for the next two years. It definitely puts a positive mindset in the back of my head,” Walker said when we got the chance to sit down and talk to him in the cafeteria of the Penrith rink while the All Stars game was in full swing. Getting to this point has been a long journey for Walker, having left Australia at the age of 13 for the Czech Republic. But it’s the same story you hear from many who excel at a sport from a young age. Dominating the competition both in his own age group and against players that were significantly older, Walker made the choice to leave everything familiar and set off on a journey that would lead him to the position he is in today. After rising through HC Vitkovices junior ranks, Walker cracked the roster of the European pro leagues when he joined the Czech professional league at just 17 years old, a league through which the likes of Jaromir Jagr, Zendo Chara and more recently Tomas Hertel and Pavel Zacha have traveled. From there he moved to the States joining the Youngstown Phantoms before eventually signing a contract with the Capitals’ AHL affiliate the Hersey Bears in 2013. He was drafted by the Capitals in the 2014 Entry Draft. However, it was before he was even drafted that the then winger, now center, saw his first NHL action after receiving an invite to the Capitals 2013 training camp. Performing well enough to earn himself valuable ice time during the 2013-14 NHL pre-season, Walker himself admitted that it was those games that made him believe that his NHL pipe dream really could be a reality. As with any young upstart coming into the league, there are always moments when you have to pinch yourself and question how you got there. Particularly when you’re drafted by a team that is captained by one of if not the most prolific scorers of this decade. “When you’re in practice going on a two-on-one with Ovechkin, being a kid and doing that was pretty special,” Walker said. It’s a funny thing watching the man on whose shoulders an entire country’s hopes and dream rest. In a league in which there is much talk about being ‘the next one’ little thought is given to being ‘the first one’ with only a handful of active players in the NHL able to claim the title. However, watching Walker at the All Stars game in Penrith you can see that there is an easy sort of camaraderie between him and many of the players and spectators alike. He grew up here on this ice, played in state tournaments for these teams. A Blacktown Flyers banner hangs from the far wall, the orange an ode that like many Australian league teams, is a small nod to the NHL team from which they ‘stole’ their name. Even at AIHL games, the highest profile league in the country, Walker remains unassuming, dropping the first puck with a bashful smile, laughing with his former Sydney Ice Dogs team mates, mingling happily with the people who call him ‘Stormy’, a relic of sorts from his days playing on home soil. However, all this is not to say that he’s not famous in his own right. Children can usually be found trailing near him at AIHL games whispering among themselves as they nervously line up for autographs. And almost every AIHL player around the same age of Walker seems to have a story of the time they beat, or were beaten by, Australia’s most successful hockey export. It’s a quiet awe, a sort of swelling national pride that grows when people talk about him. The idea that this isn’t just a hockey player, this is an Australian hockey player, almost surreal to those who know his name, know his story. “I think I’m ready. I’ve played four seasons now in Hersey and I think I want a chance to prove that I can keep up at the NHL level and hopefully I get a chance during pre-season to play in a bunch of games and show what I can do,” Walker said, turning serious as he talks about his chances of cracking the NHL. The Capitals are a team in transition. The back-to-back Presidents Trophy winners are re-tooling after free agency and salary cap pressure forced them to part ways with several players from the 2016-17 team meaning that even for a team as deep as the Capitals, there might finally be some space in the lineup. That doesn’t however mean it’s a done deal for Walker. Every player needs to prove their worth starting at training camp which began on Friday, September 15. Thirty-one forwards alone were not on the roster last season, and were vying for their shot at the show this year. “I just need to play a little better with the puck particularly in the D-zone,” Walker said, reflecting on the previous years and what he now knows. Plenty of analysts have placed Walker as a shoe-in for the fourth line, left wing position previously held by Daniel Winnik alongside a returning Jay Beagle and Devante Smith-Pelly who is new to the Capitals roster, moving from the New Jersey Devils. And with both Washington’s general manager Brian MacLellan and coach Barry Trotz already citing their support of the youngster, this could be Walker’s most important pre-season ever. He’s off to a fanstastic start, scoring the first goal of the Capitals’ preseason – shorthanded at that. Only time will tell if Nathan Walker will make it. But if he does, when he does, there is no telling how it will change the landscape of Australia, and of Australian hockey forever.